I first came across Graham Harman a few months back reading a collection of his short stories titled Circus Philosophicus. The stories are mostly pretty poor in that they operate solely as long-winded examples that illustrate his philosophy – a philosophy, which is itself strange and utterly compelling. When Harman writes in a more formal style, he is riveting to read. His philosophy is object-orientated and comes under the umbrella term of ‘Speculative Realism,’ which emerged from a conference held in Goldsmiths, University of London in 2007. It is not a philosophy of access to objects, i.e. it does not privilege the human being over other entities. It is as if Harman and co. have gone one step beyond Heidegger’s ‘tool analysis,’ to a sort of ‘tool being.’* In any case, his writings feature as a point of reference for the works in Tool-use, an exhibition on show currently at the Oonagh Young Gallery in Dublin 1. 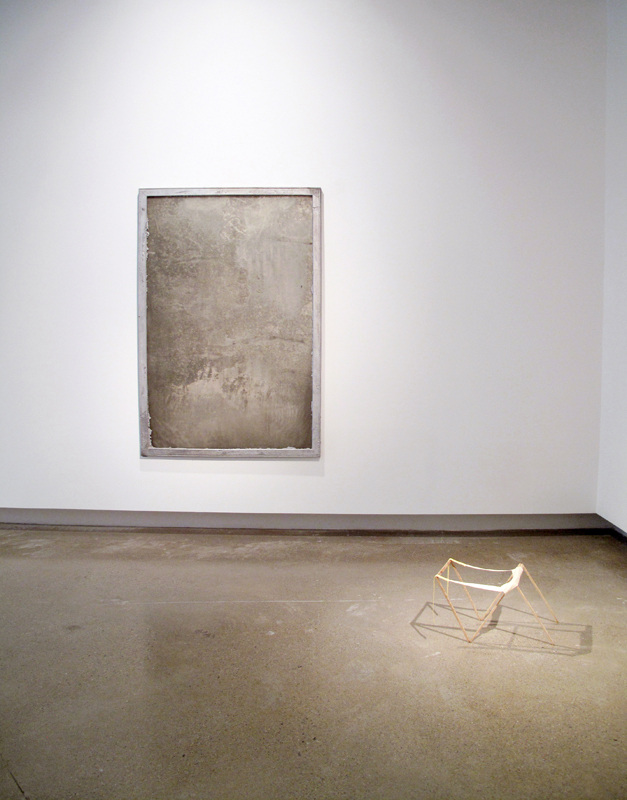 Tool-use, installation view, 2011; image courtesy David Beattie and The Oonagh Young Gallery. The show is curated by the Dublin-based artist David Beattie. At first glance there seems to be a similarity between his recent work and some of the works in this show, by which I mean that there is a conversation about the materials being employed, that takes place on at least two registers. One register being in relation to the strength of the materials, i.e. their ‘materiality,’ or what they need to do, or how they need to be placed so as they can resist forces. While on the other register we are asked to view the materials as legible objects of everyday use. Neither register is satisfactorily apprehended here, which is a good thing. There are two wall-mounted pieces (or maybe three, more of which later) – one is Adam Thompson’s reclaimed signboard, placed within a large aluminium picture frame. It is, relative to the other pieces in the show, by far the most physically dominant. It is hung portrait style and seems to gaze across the gallery space at Sam Keogh’s Shroud. There is a weird, almost B-movie-special-effects-sumptuousness to the objects Keogh makes. Shroud is, at first, a rough rectangular piece of tin foil taped to the wall with some mylar applied to its centre. Is it a subtle piece of sculpture, or a painting? I heard him recently describe one of his sculptures as “godless,” and appropriately this unstable piece seems at first to profane the art object as commodity, but then you realise that you are in a gallery and that this is for sale. The piece then seems to profane the belief that a shroud is decrepit, ancient and thereby of worth. It also seems to profane the fact that this is just a piece of tin foil that had once been folded over and perhaps even used for something else outside of this art context. The creases from this folding creates a small, haphazard tectonic grid that manifests itself as squared facets on the surface. One could look at this piece for an age and not fully apprehend it, which I suspect is exactly the point, but then of course I could, or almost should be wrong. 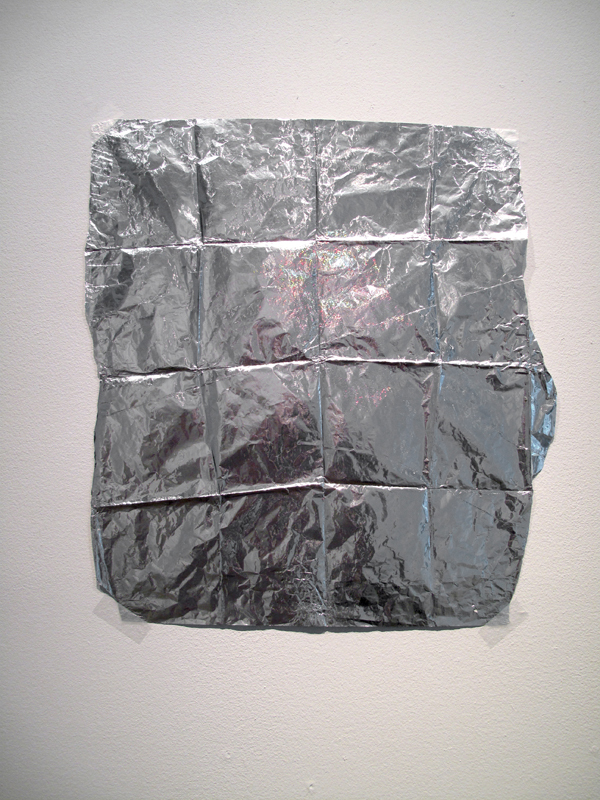 Sam Keogh: Shroud, tin foil, tape, mylar, 2011; Image courtesy David Beattie and the Oonagh Young Gallery. Behind it, I mean physically behind it, is the false wall of the Oonagh Young Gallery, and behind that is a cold, structural, reinforced concrete wall, and if we continue in this direction through the neighbouring beauty salon and on for about fifteen meters, we would find ourselves in The LAB amidst another set of handmade geometries. Niall de Buitléar’s Out of order is an obsessive analysis of 2-d and 3-d shapes, drawing, building and process. 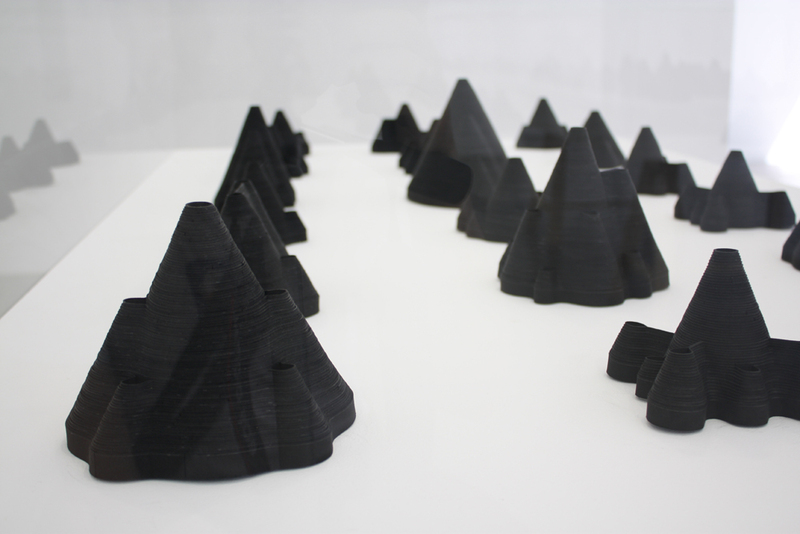 On the ground floor of The LAB gallery sit three large, white vitrines housing small, organically evolving and morphing sculptures made from layers of black paper. On the walls, laid out in grids, is what looks like a series of plan view blue-prints of the sculptures, or, these could be plan view blue prints of some strange un-built, ancient burial chambers. Perhaps “blue-print” is a misleading word, as the framed drawings are made with white pencil on black paper, inverting the colours of the sculptural work. These sculptures appear to be a development of the large, mysterious and memorable cardboard sculptures he showed at the RHA Futures in 2010. Each shape in this instance starts as a circular absence, or a number of circular absences, over which is wrapped this black paper which emanates concentrically outward until it meets the concentric emanations of another neighbouring circle, which then affects and creates the eventual form. The external outline of the base of these small, delicate sculptures is a function of the number and thickness of the layers of wrapped paper, and the positioning and number of the circles relative to each other. The work sits somewhere between intuition and analysis, and one gets the impression that the adding of the layers of paper was stopped just before the object started to lose its individuality. There are fifty-four of these sculptures, these relics of process, and each one has a personality and no doubt some logic or pattern to its placement. Niall de Buitlear: Untitled, paper sculptures, installation(detail), 2011; image courtesy the artist. On the ground beside this sits Sean Edwards’ ‘unfinished’ Painting of a photocopy for a dolls house paper (with spill). It is like an interrupted piece of Op-art. The skewering of scale inherent in it being laid on the ground of the gallery is playful and it seems coherent, if that’s the right word, with the wonky rectilinear grids, or parts of grids that appear over again in this exhibition. Matt Harle’s small, delicate portal frame structure is an object that appears to have been discovered rather than made. It wants to fall over. It is comprised of three n-shaped frames of plywood, painted white, which lean away from each other but are held up by sewn strips of cast paint, draped and pinned across the tops of the frames. The paint strips operate as ties for the tops of the frames, and it is this balance and mutual reliance of the materials on each other that collects this piece into its position of gentle, uncertain defiance. The light above this piece re-words and projects a confusion of shadowed structures on the gallery floor, suggesting outlines for where it might collapse. 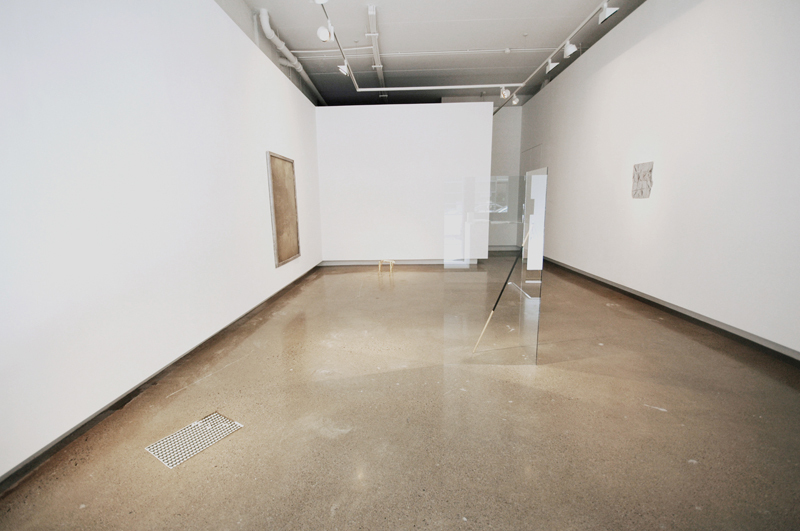 Tool-use, Adam Thompson and Matt Harle, installation view, 2011; Image courtesy David Beattie and The Oonagh Young Gallery. Beattie has chosen five intricate and layered pieces of work, and with these objects there is at once a subversion and a making explicit of, the ‘other lives’ of the materials being employed. The reference to Harman seems tokenistic, in that, at some level Speculative Realism can be applied to almost any object. Perhaps to stay really true to this object-orientated philosophy, a gallery space is not the best choice of site at all, it being a place where the privilege lies with the spectator’s will to access. Perhaps these pieces should be placed away from our gaze altogether. But then, that wouldn’t be much fun at all. Adrian Duncan is an artist and writer based in Dublin.